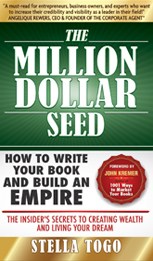 Stella Togo, the Book Writing and Marketing Acceleration Coach is the author of The Million Dollar Seed: How to Write Your Book and Build an Empire and In Honor of Women: A Revolutionary Approach to Preventing Breast Cancer (Ballantine Books, 1998). Stella teaches business professionals and entrepreneurs how to grow their book concept into a successful and profitable business. As a speaker, trainer and progressive mentor, Stella takes first time book writers of many genres, from just writing a book to being successful thought leaders, coaches and authorpreneurs. Stella’s greatest mission is to bring expanded business awareness to today’s industry specific professionals, entrepreneurs, writers and authors by helping them reach their highest potential with their natural talents, skills and an abundance of products. Stella’s writing career began with a four-hundred page handwritten journal resulting from her breast cancer recovery. Today, Stella is a twenty-year-plus survivor and one who believes that no dream is too small. After three rewrites and a study where she interviewed over two hundred breast cancer survivors, she decided this work simply had to be published in one way or another. During her study, Stella discovered ten emotional and psychological commonalities linked to breast cancer, which catapulted her desire for publication. After receiving fifty letters of rejection from publishers and lots of conversations with editors, she decided to self-publish her book. Three months later, she received a call from Random House. Ballantine Books, a division of Random House, bought the rights and published her second edition, In Honor of Women, A Revolutionary Approach to Preventing Breast Cancer and Other Diseases (Ballantine Books, 1998). Her endorsements from five best-selling authors certainly helped seal the deal! Stella Crawley brings inspired hope into a fearful situation. May her gentle comfort reach the hearts of women everywhere! Stella made a promise to herself that she would help other writers achieve their dream and avoid many pitfalls. Her five year writing experience gave her SO much insight that she now offers lots of shortcuts! Since then, it has been her passion and belief that most people, equipped with the proper tools, can write and publish their book within six to twelve months. Stella has taught numerous classes on both elementary and college levels. She believes that everyone has at least one book inside of them that can inspire others to live a fuller and happier life. Today she is considered a leading literary coach for writers and authors alike. Her expertise in literary marketing helps authors soar to great heights.